In March of 1956, rockabilly looked to be the next big thing. A month before, Sun Records had released Carl Perkins' "Blue Suede Shoes," and RCA Victor followed that up with Elvis Presley's "Heartbreak Hotel." Now the two records were chasing each other up the charts. RCA arguably had the top male contender in the field, who was scandalizing and titillating audiences with his pelvic gyrations. Now the label needed a female artist to promote. RCA executive Steve Sholes soon found what he was looking for in 15-year-old Janis Martin. This Southerlin, Va., native sang with a force and depth that often belied her young age--a trait that would mark the long line of Nashville-based wunderkinder who followed her, from Brenda Lee to Tanya Tucker to LeAnn Rimes. But the story of Martin's brief Nashville career also explodes two myths propagated by 40 years of revisionist music history. One, she might have been a teenage girl, but she could rock just as hard as any of her male contemporaries; and two, her best records, absolute classics, were recorded in Nashville--a town often portrayed as having no understanding of rock 'n' roll. Forty years later, Martin's records remain some of the most rockin', most thrilling hillbilly music ever to emerge from the Music City. By the time she hit Nashville, Martin was already a seven-year veteran of the music business. "I had a typical show-business mother who put me in the business when I was 8 years old," she recalls. "I never was allowed to play with other children my age. She was grooming me." 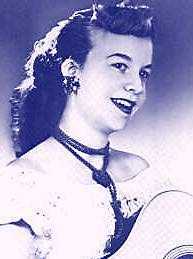 Although the young Martin played largely country and bluegrass for Virginia audiences, her first love was R&B. Indeed, at 13, she was developing her own proto-rockabilly style on WRVA's Old Dominion Barn Dance, which broadcast out of Richmond, Va. "The audience didn't know what to make of it. They didn't hardly allow electric instruments, and I was doing some songs by black artists--stuff like Ruth Brown's 'Mama, He Treats Your Daughter Mean.' "
It was this style of music that Martin featured on the demo she sent to RCA's Steve Sholes, who promptly signed her and set up her first recording session with RCA's top man in Nashville, Chet Atkins. "Chet Atkins seemed wide open to [rockabilly]. He told me it was the new music, the coming thing. I thought I was cutting basically up-tempo country." Rockabilly might have been the hot new thing, but Martin's first session was attended by some of Nashville's most established session men, including Grady Martin, Buddy Harman, and Floyd Cramer. The musicians convened in the converted chapel on McGavock Street where Presley had recorded "Heartbreak Hotel." "They made me feel right at home. I was nervous and all. I just went in, and they played the demo tape I'd sent down. They kicked it around and did their own arrangement. There was nothing written out. Floyd Cramer and all of them were just old country people like I was." Martin's subsequent sessions for RCA were split between Nashville and New York; she quickly learned that cutting records in the big city was an entirely different story. "All those musicians up there had to have sheet music; they seemed to act like it was just a job. [Guitarist] George Barnes liked the music, and it showed. He really cooked. But otherwise, it was kind of a cold atmosphere in New York." The difference shows on the records too. While the sides cut in New York contain a few classics such as "Barefoot Baby," Martin's hillbilly soul shines through on the sides she cut in Nashville, especially "Love Me to Pieces," the incredible "Bang, Bang," and the sublime "Blues Keep Calling." Capitalizing on Elvis Presley's success, RCA dubbed her "The Female Elvis," a title that would come to haunt her. But at first, it helped sell some records: Her first single, "Will You, Willyum" b/w "Drugstore Rock 'n' Roll," sold over 750,000 copies. Appearances on the Grand Ole Opry, American Bandstand, and The Tonight Show followed quickly, and Billboard named her "Most Promising Female Vocalist for 1956." Other successful singles followed, including a cover of Roy Orbison's "Ooby Dooby," and (of course) a tribute to her labelmate, "My Boy Elvis." Ironically, "The Female Elvis" only had two brief encounters with her male counterpart. "I said hello to him backstage at a show in Danville, Va., once," she recalls, "and later I ran into him in New York at RCA's studio. He said, 'How's it goin'?' I said, 'Fine, how about you?' He said, 'It's rough!' That's about all the words we ever exchanged. To tell you the truth, I wasn't all that impressed with Elvis at first. I've always liked Carl Perkins better." In fact, Martin says, she was never all that keen on being cast in Presley's mold. "I think 'The Female Elvis' bit was a hindrance--the audience expected a lot of hip gyrations like he did, and I got kind of tired of being called vulgar. It put a lot of pressure on me." Some people, it seemed, weren't ready for a female rock 'n' roller. "About a year after I started recording for RCA, some of the established country artists started fighting against rockabilly. Certain ones I went on tour with were very unpleasant to me." Beyond that, issues of marriage and motherhood created problems for Martin that her male counterparts didn't have to deal with. A few weeks before she signed with RCA, she had secretly married her boyfriend--an ironic turn of events, given one of the songs she cut at that first session. "At the time I was recording 'Let's Elope, Baby,' my parents didn't even know I was married. I had to chuckle to myself. It was strange. Chet picked four songs for that session, and when he came up with that one, he said, 'This will be perfect for you, because you're young, and kids run off and get married.' "
Since her husband was in the army and had transferred to Europe shortly after the wedding, Martin managed to keep her marriage secret for over a year. But after a tour of Germany in the fall of 1957--and a brief reunion with her spouse--she found herself pregnant. And that, it would have seemed, was the end of her career. "They had spent so much money and time and effort supporting a little sweet-faced, pony-tailed girl, and all of a sudden this teenaged star they had was a married woman expecting a baby. Steve Sholes tried putting me into the pop field and tried to promote a more mature image. I wasn't really that interested in it. I wanted to settle down and have my baby. "I was eight months pregnant when I did my last session for RCA up in New York, and Steve Sholes was standing in the control room bawling his eyes out. He told my mother, 'She could have been as big as Elvis or bigger.' "
But Martin never quite pulled away completely from music. In 1960, she made a halfhearted return, cutting two singles for Palette Records at Owen Bradley's studio. Then she disappeared for a time, resurfacing in 1973, after she'd divorced for the second time. "When I got the band together in the '70s," she remembers. "I realized it wasn't momma pushing me any longer. I hadn't realized how much I missed it and loved it." Still playing her mix of rock 'n' roll and country, she decided to travel to Nashville and pay a visit to her old friend, Chet Atkins. "Chet told me, 'Keep doing what you're doing, because this rockabilly revival is hitting like the devil over in England.' "
Then, in 1979, the European tour offers started coming in. Martin still remembers her incredulity: "I said, 'It can't be. It can't be.' " It took a while for the singer to gather her nerve and return to the road, but three years later, on her 42nd birthday, she played her first date in England. "I can't begin to tell you what it was like--like stepping back in time," she says. "Those kids dressed like we did in the '50s. Here I'd been a housewife and a mother. When I hit the stage, it was like I'd come home." By the '70s, Martin's original 45s had become sought-after collectors' items. Then, in the late '70s, the German reissue label Bear Family collected all her RCA recordings onto two LPs. Now those recordings are available, along with the four Palette sides, on one CD. With her music back in print again, Martin has influenced a whole new generation of female rockabillies, among them Rosie Flores. In fact, it was Flores who helped reintroduce Martin to American audiences in 1996 with her Rockabilly Filly album, which featured the two women singing a couple of duets. Now in her late 50s, Janis Martin still loves performing, but her priorities have shifted. She's settled down and content in Danville, Va., where she's the manager of a country club. "I could probably make a living [touring]," she says. "But I have the best of both worlds. I've got a career, I've got a happy life, and I realize that whatever I do now is gravy. "I've had a wonderful life. You'd be surprised at the letters and inquiries I get from people all over the world. One day, not long after we moved in the house we live in now, my mail carrier drove down here and said, 'Just who the hell are you?' "
Martin says she plans to retire in four years--but that doesn't mean she'd ever think of putting down her guitar for good. "We'll see what happens when I have more time to play." Rosie Flores, for one, would like to see her return to the studio. "I would love to produce Janis Martin, put together the best band possible, and bring her back out again. She sings so strong, it's incredible." Martin's performances on the Rockabilly Filly album bear Flores out. The duo's cover of "Blues Keep Calling" rivals Martin's original, the maturity of her voice adding even greater depth to the world-weary lyrics. Only time will tell if "The Female Elvis" will decide to reclaim her title. For now, she's scheduled to headline the Viva Las Vegas 2 rockabilly festival next April in Las Vegas along with fellow rockabilly survivors Sonny Burgess, Mac Curtis, and Curtis Gordon. Even after all these years, she says, she still feels the excitement of being a musician--maybe more so than before. "When you come out on that stage, the love is incredible. I guess had to become an old lady before I really appreciated it.